The hyperglycaemic clamp technique and the frequently sampled IVGTT are unsuitable techniques to assess beta cell function (BCF) in large cohorts. Therefore, the aim of this study was to evaluate the discriminatory ability of simple OGTT-based BCF indices for prediction of prediabetes (meaning impaired fasting glucose and/or impaired glucose tolerance) and type 2 diabetes. Glucose metabolism status was assessed by 2 h 75 g OGTT at baseline (n = 476, mean age 59.2 years, 38.7% women) and after 7 years of follow-up (n = 416) in the Cohort on Diabetes and Atherosclerosis Maastricht (CODAM) study (1999–2009). Baseline plasma glucose, insulin and C-peptide values during OGTTs were used to calculate 21 simple indices of BCF. Disposition indices (BCF index × Matsuda index), to compensate for the prevailing level of insulin resistance, were calculated for the BCF indices with the best discriminatory abilities. The discriminatory ability of the BCF indices was estimated by the area under the receiver operating characteristics curve (ROC AUC) with an outcome of incident prediabetes (n = 73) or type 2 diabetes (n = 60 and n = 18 cases, respectively, in individuals who were non-diabetic or had normal glucose metabolism at baseline). For incident prediabetes (n = 73), all ROC AUCs were less than 70%, whereas for incident type 2 diabetes, I30/I0, CP30/CP0, ΔI30/ΔG30, ΔCP30/ΔG30 (where I, CP and G are the plasma concentrations of insulin, C-peptide and glucose, respectively, at the times indicated), and corrected insulin response at 30 min had ROC AUCs over 70%. In at-baseline non-diabetic individuals, disposition indices ΔI30/ΔG30, ΔCP30/ΔG30 and corrected insulin response at 30 min had ROC AUCs of over 80% for incident type 2 diabetes. Moreover, these BCF disposition indices had significantly better discriminatory abilities for incident type 2 diabetes than the Matsuda index alone. BCF indices reflecting early-phase insulin secretion have the best ability to discriminate individuals who will develop prediabetes and type 2 diabetes. Of these, ΔCP30/ΔG30, often referred to as the C-peptidogenic index, performed consistently well. Louise J. C. J. den Biggelaar and Simone J. S. Sep are joint first authors. The online version of this article (doi: 10.1007/s00125-016-4165-3) contains peer-reviewed but unedited supplementary material, which is available to authorised users. Type 2 diabetes is characterised by reduced metabolic sensitivity to insulin and insufficient insulin secretion by pancreatic beta cells. Insulin resistance in itself is an insufficient cause of type 2 diabetes, because of the pancreatic beta cells’ ability to compensate for the prevailing level of insulin resistance by increasing insulin secretion. However, if the beta cells are unable to compensate for the prevailing insulin resistance, hyperglycaemia arises and can cause a transition from NGM to prediabetes, and eventually to type 2 diabetes [1, 2, 3]. The assessment of beta cell function (BCF) in vivo is complex because of its interplay with other key variables in glucose homeostasis, i.e. blood glucose levels, insulin sensitivity and hepatic insulin extraction [2, 4]. The simplest methods for the assessment of BCF in epidemiological studies are those based on basal circulating levels of glucose, insulin and/or C-peptide, such as HOMA-B . Fasting levels, however, cannot provide insight into the secretory response of beta cells to rising and falling glucose concentrations [2, 3, 6]. Alternative approaches are based on beta cell responses after administration of nutrients, often glucose. Intravenous approaches include the hyperglycaemic clamp technique and the frequently sampled IVGTT. However, disadvantages of these methods are complex protocols, high costs and the non-physiological route and pattern of glucose administration [3, 6]. Oral administration of nutrients, as applied during an OGTT or mixed-meal tolerance test, enables assessment of the insulin secretory response under more physiological conditions . Both oral methods stimulate the incretin hormone effect and allow for the simultaneous assessment of BCF, insulin sensitivity and glucose metabolism status. The mixed-meal tolerance test most closely tracks the physiological responses that are expected to occur during an individual’s normal day-to-day life (to a load of mixed nutrients). The OGTT, however, can be standardised more easily and is simple when it comes to administering the glucose load. Therefore, the OGTT is often the preferred method in large epidemiological studies. Several simple BCF indices obtained from an OGTT have been proposed and validated against intravenous methods, with the major drawback of a non-physiologically triggered insulin secretory response in the latter. Therefore, the objective of this study was to compare available, simple OGTT-based BCF indices that use plasma concentrations of glucose, insulin and/or C-peptide to identify their ability to discriminate glucose metabolism status (normal glucose metabolism [NGM], prediabetes [meaning impaired fasting glucose and/or impaired glucose tolerance] and type 2 diabetes), which may approximate conceptually a more physiological aspect of BCF assessment. We used data from the Cohort on Diabetes and Atherosclerosis Maastricht (CODAM) study, a longitudinal observational study on the natural progression of glucose tolerance . CODAM includes 574 individuals with an elevated risk of type 2 diabetes and cardiovascular disease , who were extensively characterised at baseline with regard to their lifestyle and cardiovascular and metabolic profile during two visits to the university’s metabolic research unit. After a median follow-up period of 7.0 years (interquartile range [IQR] 6.9–7.1 years), 491 individuals participated in the follow-up measurements (overall attrition rate 14%). The participants who withdrew from the study during follow-up had essentially the same baseline characteristics as the study cohort. The CODAM study was approved by the Medical Ethical Committee of the Maastricht University Medical Center, and all participants gave written informed consent. For the present analyses, we excluded 83 individuals with previously diagnosed type 2 diabetes at baseline (defined as self-reported diagnosis and/or use of glucose-lowering medication) who did not undergo an OGTT as per the protocol, and 15 individuals because of incomplete OGTT data. This resulted in a study population of 476 individuals, with glucose metabolism ranging from NGM (n = 294) to prediabetes (n = 122) to newly diagnosed type 2 diabetes (n = 60), using the WHO criteria as specified below . Longitudinal analyses were restricted to individuals without type 2 diabetes who participated in the follow-up measurements (n = 294 NGM, n = 122 prediabetes), of whom 73 (24.8%) individuals with NGM progressed to prediabetes, and 17 (5.8%) individuals with NGM and 46 (37.7%) with prediabetes progressed to type 2 diabetes. After an overnight fast (>12 h), venous blood samples were collected before and 30, 60 and 120 min after ingestion of 75 g glucose. Plasma for the assessment of insulin and C-peptide was collected in EDTA tubes on ice, separated after centrifugation (3000×g for 15 min at 4°C), and stored at −80°C until the assays were performed. The time between collection and storage was less than 2 h.
Insulin and C-peptide were measured by use of a custom Meso Scale Discovery duplex array (Meso Scale Discovery, Gaithersburg, MD, USA; www.mesoscale.com). In short, 96 well-plates, with capture antibodies against insulin and C-peptide patterned on distinct spots in the same well were supplied by the manufacturer. Samples (10 μl/well), detection antibodies and read buffer for electrochemiluminescence were applied according to manufacturer’s instruction, and plates were read using a SECTOR Imager 2400 (Meso Scale Discovery). The detection ranges of the assay were 35–25,000 pg/ml for insulin and 70–50,000 pg/ml for C-peptide. Interassay CVs for insulin and C-peptide were 9.7% and 7.9%, respectively. Insulin and C-peptide values were converted from pg/ml to pmol/l using a molar mass of 5808 g for insulin and 3010 g for C-peptide. Plasma for the assessment of glucose was collected in NaF/KOx tubes on ice. Glucose was measured by use of the hexokinase method (HK-G6PD method; Glucose HK 125; ABX Diagnostics, Montpellier, France). Glucose metabolism status was defined according to the WHO 2006 criteria : NGM (fasting plasma glucose <6.1 mmol/l and 2 h post-load plasma glucose <7.8 mmol/l), prediabetes (fasting plasma glucose levels of 6.1–6.9 mmol/l and/or 2 h post-load glucose levels of 7.8–11.1 mmol/l) and type 2 diabetes (fasting plasma glucose ≥7.0 mmol/l and/or 2 h post-load glucose ≥11.1 mmol/l). Available OGTT-based BCF indices were extracted from the literature and included nine early-phase measures (based on the first 30 min of the OGTT), six late-phase measures (based on the fasting condition combined with the last 60–120 min of the OGTT) and two overall insulin secretion measures (based on all OGTT sampling points) (Table 1). Kahn et al identified a hyperbolic relationship between insulin sensitivity and secretion . The product of insulin sensitivity and insulin secretion is called the disposition index (DI) and reflects a measure of BCF corrected for the degree of insulin sensitivity. In this study, the Matsuda index was used as a measure of insulin sensitivity (Matsuda index: 10,000 / √G0 × I0 × mean G × mean I; where G and I are the plasma glucose and insulin values, respectively, at the time indicated) . The OGTT-based mathematical model of Mari et al  describes insulin secretion as the sum of two components. Glucose sensitivity describes the degree of pancreatic beta cell responsiveness to absolute blood glucose levels (glucose–insulin dose–response curve). The beta cell potentiation factor modulates the dose–response curve as a positive function of time in individuals with NGM. The second component of insulin secretion is beta cell rate sensitivity, which represents early-phase insulin release. We evaluated these mathematical model-based BCF indices as additional analyses as these BCF components cannot be assessed by simple BCF indices. Body height (cm) and weight (kg) were measured to the nearest 1 cm and 0.1 kg with the participants wearing light clothing and no shoes . Total cholesterol, HDL-cholesterol and triacylglycerol were determined using enzymatic techniques (Roche Diagnostics, Mannheim, Germany). LDL-cholesterol was calculated using the Friedewald formula . NEFA were assessed in EDTA plasma using an enzymatic colorimetric method (NEFA-C; Wako Chemicals, Neuss, Germany) . Blood pressure was measured using an oscillometric precision blood pressure instrument (Maxi-Stabol 3; Speidel & Keller, now Welch Allyn, Skaneateles Falls, NY, USA) . Smoking status, medication use and the prevalence of a history of cardiovascular disease and cardiovascular events were determined by self-report . Physical activity was measured by the validated Short Questionnaire to Assess Health-enhancing Physical Activity (SQUASH) . All analyses were performed using the software package SPSS statistics version 22.0 for Windows (SPSS, IBM Corp, Armonk, NY, USA). Differences in median BCF across glucose metabolism groups were tested by Kruskal–Wallis and Mann–Whitney U tests. The primary outcome was the discriminatory ability of the BCF indices to predict prediabetes and type 2 diabetes. The discriminatory ability was assessed by use of the area under the receiver operating characteristics (ROC) curve with either non-prediabetes (i.e. NGM) or non-diabetes as the reference category. Differences between consecutively ranked ROC AUCs were tested by the algorithm developed by DeLong et al . ROC AUCs of the DIs (the products of the BCF index and Matsuda index) were assessed for BCF indices with ROC AUCs of 0.70 or above for incident prediabetes and/or type 2 diabetes . Additional analyses were performed to cross-sectionally evaluate the discriminatory abilities of the BCF indices for prevalent prediabetes and type 2 diabetes. Finally, the discriminatory ability of the mathematical model variables of Mari et al  were evaluated: beta cell glucose sensitivity, beta cell rate sensitivity and beta cell potentiation factor. The confidence level used in the statistical analyses was 95%, corresponding to a p value of 0.05. The median age was similar across groups of glucose metabolism status at baseline (Table 2). The male to female ratio was higher in participants with type 2 diabetes. 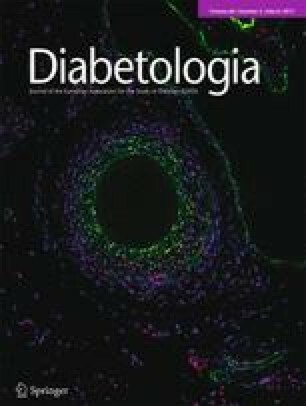 Median fasting and 2 h post-load plasma concentrations of glucose and insulin, and HbA1c increased in the order NGM to prediabetes to type 2 diabetes, whereas median insulin sensitivity decreased with impairment of glucose metabolism. Furthermore, BP increased and the lipid profile worsened with impairment of glucose metabolism. In addition, the proportion of current smokers was lowest among individuals with type 2 diabetes, but individuals with prediabetes or type 2 diabetes were less physically active than individuals with NGM (Table 2). Overall, the median values of all BCF indices differed statistically significantly by glucose metabolism status at baseline, reflecting the fact that impaired BCF went along with impairment of glucose metabolism (Table 3). For most indices, the largest proportional difference in BCF was observed between individuals with prediabetes and type 2 diabetes. Of the individuals with NGM or prediabetes at baseline, 63 (17 NGM and 46 prediabetes) progressed to type 2 diabetes at follow-up, and 73 individuals with NGM progressed to prediabetes at follow-up (Table 4). ROC AUCs for incident type 2 diabetes revealed estimates higher than 70% for I30/I0, CP30/CP0, ΔCP30/ΔG30 and corrected insulin response at 30 min (CIR30), with ROC AUCs ranging between 74% and 81% (Table 4). Restricting the population to individuals who had NGM at baseline did not materially alter the results; the same five BCF indices and CP0/G0 had ROC AUCs higher than 70% (AUCs 70–84%). For incident prediabetes, the ROC AUCs of all BCF indices were less than 70%. After calculating the DIs, the ROC AUCs for ΔI30/ΔG30, ΔCP30/ΔG30 and CIR30 had the best discriminatory abilities (Fig. 1; see electronic supplementary material [ESM] Fig. 1 for ROC characteristics). Moreover, for incident type 2 diabetes, these BCF DIs had significantly better abilities than the Matsuda index alone (Fig. 1a). The ability of all BCF indices to cross-sectionally discriminate between glucose metabolism groups was evaluated. ROC AUCs for type 2 diabetes revealed estimates higher than 70% for all early-phase indices, the late-phase index CIR120 and the two overall insulin secretion indices (ESM Table 1). The five indices that were ranked highest in the prospective analyses for incident type 2 diabetes, in individuals who were non-diabetic or had NGM at baseline, also showed high ROC AUCs in the cross-sectional analyses, with ROC AUCs in the range 78–88% and 82–92%, respectively. The three DIs that were ranked highest in the longitudinal analyses, ΔI30/ΔG30, ΔCP30/ΔG30 and CIR30, also had the best ROC AUCs in the cross-sectional analyses (data not shown). In individuals who were non-diabetic or had NGM at baseline, only the mathematical model variable of beta cell glucose sensitivity was able to discriminate incident type 2 diabetes (ROC AUCs of 78% for both groups). Compared with the simple BCF indices, only the C-peptidogenic index had better discriminatory abilities than beta cell glucose sensitivity for predicting incident type 2 diabetes. ROC AUCs of rate sensitivity and potentiation factor ratio were less than 70% (data not shown). In this study, for incident prediabetes and type 2 diabetes, the discriminatory ability of available simple OGTT-based indices of BCF was evaluated after a median follow-up period of 7 years. Overall, early-phase indices of BCF, typically based on the insulin response in the first 30 min of the OGTT, performed best. The better ability of early-phase BCF indices to discriminate glucose metabolism status is in line with previous validation studies, which used the frequently sampled IVGTT or incident type 2 diabetes as reference standards [20, 21]. Moreover, this finding corresponds with an earlier and stronger deterioration of the early-phase secretory response in the pathogenesis of type 2 diabetes [1, 22]. The BCF indices ranked highest in our study also performed well in the evaluations of Hanson et al  and Lorenzo et al . In general, discriminatory abilities of BCF indices using C-peptide were better than those using insulin in a similar formula. This can be explained by the fact that insulin concentrations assessed in peripheral blood do not perfectly reflect insulin secretion by the pancreas. Pancreatic beta cells secrete insulin into the portal vein perfusing the liver, where insulin is partially cleared prior to entering the peripheral circulation [2, 3, 4]. A more valid estimation of prehepatic insulin secretion can be obtained from C-peptide, which is co-secreted with insulin in equimolar amounts and avoids hepatic degradation [2, 3, 4]. For prediabetes, we observed a lower discriminatory ability of the BCF indices than was seen for type 2 diabetes. This probably reflects the gradual deterioration of BCF during the pathogenesis of type 2 diabetes. In prediabetic individuals, insulin secretion is still sufficient to compensate for a certain level of insulin resistance and to maintain glucose levels within the non-diabetic range [2, 23]. In our data, more detailed analyses of the subtypes of prediabetes, i.e. impaired fasting glucose and impaired glucose tolerance, revealed a trend towards higher ROC AUCs for individuals with impaired glucose tolerance relative to those with NGM than for individuals with impaired fasting glucose relative to NGM (data not shown). This is in line with the post-load glucose metabolism of individuals with impaired fasting glucose being normal, reflecting an adequate (compensatory) post-load BCF. Future studies that focus on estimates of insulin secretory function in prediabetes subtypes may provide novel insights into the aspects of BCF covered by the several BCF indices. In line with previous findings [24, 25], discriminatory abilities of the oral DIs CIR30 and ΔI30/ΔG30 were significantly better than those of the isolated BCF indices in the current study. Moreover, discriminatory abilities of the oral DIs were better than those of the Matsuda index alone, especially the DIs of ΔI30/ΔG30, ΔCP30/ΔG30 and CIR30. This suggests that ΔI30/ΔG30, ΔCP30/ΔG30 and CIR30 contributed significantly to the discrimination of glucose metabolism groups, on top of insulin sensitivity. This indicates specific features of BCF irrespective of insulin sensitivity. ROC analyses of logistic regression outcomes of the BCF indices with the Matsuda index as a covariate (using the probabilities predicted by the regression model) revealed similar results, as presented in Fig. 1 (data not shown). Theoretically, a hyperbolic function between BCF and insulin sensitivity has been suggested as a requirement to apply the DIs. In our data, such a hyperbolic function between any of the BCF indices and a measure of insulin sensitivity (e.g. the Matsuda index, HOMA-IR or the insulin sensitivity index (SI0, 120)] was not present [data not shown]). This is in line with some other studies [26, 27], but there are studies that have established a hyperbolic function between BCF and insulin sensitivity [26, 28]. In addition, artificial relations between indices of BCF and insulin sensitivity may arise when these indices are obtained from insulin and glucose concentrations during a single OGTT [26, 29]. In this case, the DIs should be calculated with caution. We found that the C-peptidogenic index (ΔCP30/ΔG30) performed better than the mathematical model variables in the present study. However, the good performance of the C-peptidogenic index does not necessarily imply a weakness of the modelling analysis. The reason is that the mathematical model measures specific aspects of BCF (beta cell glucose sensitivity, beta cell potentiation ratio and beta cell rate sensitivity), which together determine glucose metabolism. In contrast, beta cell glucose sensitivity and beta cell rate sensitivity, which have been shown to be relatively independent and both potentially important predictors of type 2 diabetes, are lumped together in the C-peptidogenic index . This may confer on the empirical index a relative advantage in terms of predictive power. The present study benefits from the comparison of all available BCF indices in one study population, which includes individuals with NGM, prediabetes and newly diagnosed type 2 diabetes. Moreover, the study has a longitudinal set-up with 7 years of follow-up. Furthermore, the assessment of plasma C-peptide concentrations enabled comparative analyses between BCF indices based on insulin and C-peptide concentrations. Some limitations also merit discussion. First, glucose metabolism status, BCF and insulin sensitivity were all obtained from a single OGTT . We aimed to minimise autocorrelation between BCF and insulin sensitivity by using the Matsuda index, which is based on fasting and mean plasma insulin and glucose concentrations during the OGTT, rather than on concentrations at specific time points only. Although our interest was in discrimination, and not in association estimates, correlations between the BCF indices and the Matsuda index were very weak overall, and additional multicollinearity diagnostics (i.e. the variance inflation factor) were negative. Finally, CODAM participants have a higher risk of type 2 diabetes than the general population, so generalisability might be limited. However, as the differences in BCF between non-diabetic and type 2 diabetic individuals in the present study population may be smaller than in the general population, the discriminatory abilities of the BCF indices in the general population may be larger. In summary, early-phase BCF indices obtained from an OGTT revealed those with the best abilities to discriminate glucose metabolism status. Overall, the C-peptidogenic index (ΔCP30/ΔG30) had the best discriminatory ability. If the degree of insulin sensitivity is taken into account by calculating the DIs, the insulinogenic index (ΔI30/ΔG30), the C-peptidogenic index (ΔCP30/ΔG30) and CIR30 had the highest ability to discriminate glucose metabolism status. Based on our results, we recommend the C-peptidogenic index (ΔCP30/ΔG30) for assessing BCF in epidemiological studies. However, the preferred combination of BCF indices reflecting different aspects of insulin secretory function should be determined in view of the specific objectives and hypotheses of the study. We thank L. Meertens (Department of Epidemiology, Maastricht University, Maastricht, the Netherlands) for her assistance with designing the graphics in the ESM. Part of this work was supported by Grants of the Netherlands Organization for Scientific Research (940-35-034) and the Dutch Diabetes Research Foundation (98.901). LJCJdB and SJSS performed mathematical model analyses and statistical analyses, interpreted the data and wrote the manuscript. SJPME and PCD contributed to the conception and interpretation of the data and to data analyses, and participated in drafting the article and critically revising it for important intellectual content. AM and EF designed the mathematical model, provided support in performing mathematical analyses, contributed to the data quality of the mathematical analyses and made important contributions to the interpretation of the BCF data. MMJvG, CGS and CJHvdK contributed to data acquisition and study coordination. CDAS provided advice and contributed to the conception of the data, to data acquisition and to study coordination. All authors contributed to and/or provided critical comments and suggestions on the manuscript, reviewed the final draft of the manuscript and gave final approval of the version to be published. PCD is the guarantor of this work.